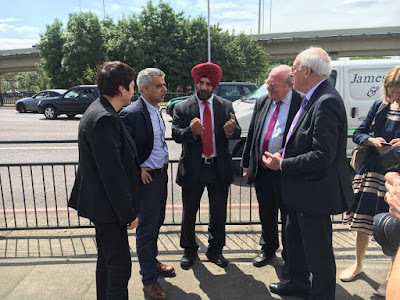 Today, Thursday, the Mayor of London, Sadiq Khan, has been visiting Redbridge and talking to local campaigners about air quality and step free access to public transport. He also wants your views on how air quality can be improved in London. I believe Britain is better off within the EU, but the British people have clearly spoken. We must now respect their democratic decision and work together to get the best possible deal for London. Our city will continue to be the best place in the world to do business. We will continue to look outwards and trade with the entire world – including the EU. That’s why I’m talking to the Government about ensuring that despite leaving the EU, London remains in the single market in order to protect our jobs, wealth and prosperity. I also want to protect you from the consequences of London’s dirty air. Air pollution is linked to 10,000 early deaths every year in our city – and the poorest Londoners are hit the hardest. I know personally how much London’s air is damaging people’s health because I recently started suffering from asthma. I’m also a parent and am concerned, like many others, that some of London’s worst pollution hotspots are around schools. Our children are being exposed to dangerously polluted air. This means they’re more at risk of developing respiratory conditions like mine. I have today put forward a number of proposals to help clean up London’s air. I’d like to know what you think, and hear your ideas on how we can improve our air quality. Your feedback will help shape my policy ideas and inform more detailed consultations in the autumn. With your help, we can clean up London’s air. It's worth mentioning that under the proposal to extend the Ultra-Low Emissions Zone out to the North and South Circular Roads, Redbridge will be cut in half. Assuming you have a car that's affected (pre-2006 for petrol engines, pre-2015 for diesel), if you live in a part of Redbridge outside the North Circular Road, such as Barkingside, Ilford, Hainault or Woodford, and you wish to drive to somewhere inside such as South Woodford, Snaresbrook or Wanstead, you will have to pay £10 (or whatever the charge turns out to be) in order to do so.